Your blood is sent through a Dialysis machine that filters away waste products, and then the clean blood is returned to your body. 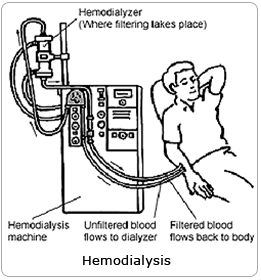 Hemodialysis is usually performed at a dialysis center three times per week for 3 to 4 hours. To undergo dialysis, AV fistula/ shunt needs to be made on the arm, it is a vascular surgery to make connection between artery and vein. Cost of dialysis, travel to the center, loss of work etc. Allergic reactions, transmission of diseases.